TALLAHASSEE, FLA. (Seminoles.com) – A momentum-swinging second quarter by LSU broke open Sunday’s game and propelled the Tigers to a 58-45 win over Florida State Women’s Basketball at the Donald L. Tucker Center. The loss to a non-conference foe on their home floor is a rare one for the Seminoles. A 22-0 second quarter by the Tigers (3-1) broke the game open, turning a 17-13 first-quarter Seminoles lead (4-1) into a 35-17 halftime deficit. The loss by the Seminoles was just their fourth non-conference home loss in their last 55 non-conference games played at the Tucker Center. A bright spot was the play of junior guard Nausia Woolfolk, who led all scorers with 14 points. 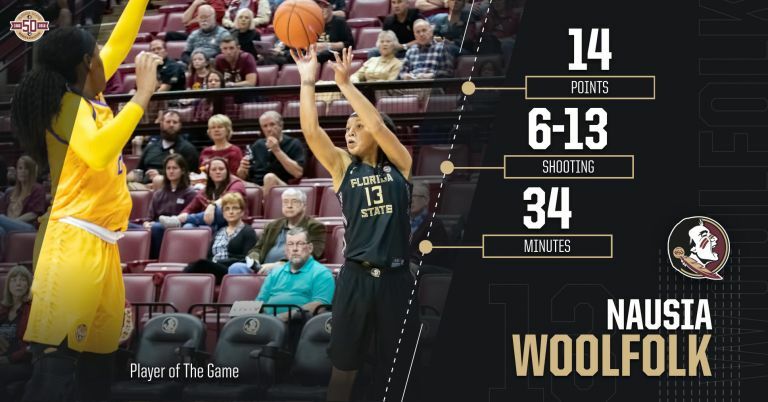 Following a game against Jacksonville where FSU drilled a program-record tying 12 3-point field goals, it was done in by a 2-for-20 performance from beyond the arc. A stingy defense by the sizeable Tigers forced a lot of tough shots both inside and out. Overall, Florida State is now 62-6 at home since the start of the 2014-15 season, highlighting the rarity that is an opponent victory in Tallahassee. Aside from the second-quarter performance, the Seminoles played pretty evenly with the Tigers – out-scoring them 17-8 in the fourth quarter in what was a lofty comeback bid. For the first time this season, FSU was out-rebounded as LSU grabbed 38 boards compared to FSU’s 34 off the glass. LSU was efficient from the field all afternoon and forced its slower pace. The Tigers shot 48.8 percent from the floor, with 43 of their 51 field-goal attempts coming inside. Their game plan of working the ball inside and getting quality drives to the hoop paid off, only attempting eight 3-point field goals. Freshman forward Valencia Myers added nine points and three steals for the Seminoles. Redshirt junior forward Kiah Gillespie nearly had a double-double with eight points and nine rebounds. Florida State looks to re-group as it heads to the Junkanoo Jam in Bimini, Bahamas, for a two-game tournament on Nov. 23-24. FSU’s first game of the tournament is against Eastern Kentucky on Friday at 3 p.m. ET.